By St. Vincent. Beggars Banquet/4AD. St. Vincent is an unusual character. 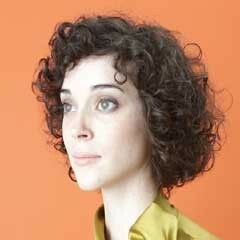 Berklee College of Music dropout, Polyphonic Spree alumnus, multi-instrumentalist, singer and songwriter, Annie Clark adopted her stage name, "St. Vincent," from the New York hospital where poet Dylan Thomas died (hours after being carted out of the White Horse Tavern). In 2007, after touring with Sufjan Stevens' band, Clark released a defiantly unique record, Marry Me. It was an extravagant production, brimming with orchestral flourishes (with former Bowie pianist Mike Garson contributing elegant piano parts), with complex time signatures and odd instrumentation segments. Clark has taken her sense of musical drama, akin to Kate Bush, and raised it another level. In contrast to Bush, who displays that drama in her vocal delivery, Clark opts to allow her instruments provide the effect. In a recent New York Times piece, the songwriter said that her new release, Actor, was inspired by some of her favorite films, including Badlands, Wizard of Oz, Stardust Memories and Snow White, re-imagining their film scores. "I wanted to make something that had the whimsy and the sweet of something very pure, like the Disney films, but also something that was kind of bloody and gory and disgusting." Clark said. "I tried to combine those two things." However, good soundtracks accentuate the image on the screen. In St. Vincent's case, the song becomes the film, and her "soundtrack" envelopes the central narrative, the voice. And occasionally it impedes on the foundation of the song, drawing attention to the musical cacophony, as a dramatic structure. It borders on what New Yorker film critic Pauline Kael once noted of Meryl Streep's acting -- drawing attention to the "acting" itself, rather than the character embodied. For her sophomore full-length release, Actor, Clark seems to try too hard to include the entire kitchen sink. The sound is, at times, too dense. And even though she worked with Austin-based producer John Congleton (Explosions in the Sky producer, engineer on Bill Callahan's excellent Sometimes I Wish We Were an Eagle), the sound they came up with doesn't allow too much for space. Her core band is comprised of talented musicians: a few Polyphonic Spree friends who performed on her previous Marry Me, along with reeds player Hideaki Aomori and drummer Matthias Boss (Sleepytime Guerilla Museum). Songs such as "Laughing With A Mouth Of Blood" and "The Bed" successfully achieve Clark's goals of blending a dark lyrical tone with a scintillating pop score, accentuated by a elegant, yet spare, orchestration. In her attempt to "top" Marry Me with Actor, Annie Clark often shines her spotlight on the instrumentation, however complex and intriguing, and on the act of production, rather than focusing on the song. And even though her musical ambition, to aim for the heavens, is quite valorous, Clark should simply allow St. Vincent to be St. Vincent.